While winning is a team effort, individual performances can sometimes make the difference between getting the W and not. Such was the case in Friday’s evening session of the Pac 12 Tournament. 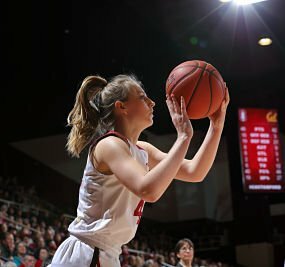 Karlie Samuelson played a pivotal role in Stanford’s quarterfinal win over Washington State Friday. Photo by Bob Drebin/ISIPhotos.com. Karlie Samuelson was on fire all game for Stanford, shooting 60 percent on 6-10 shooting from beyond the arc. She finished with 21 points to lead the Cardinal to a 66-36 victory and advance them to the semifinals of the Pac 12 Tournament. Samuelson did a fantastic job of coming off screens and moving without the ball to get really good wide open looks. Cougar coach June Daugherty had high praise for Stanford and the play of Samuelson after the game. Samuelson credited her teammates ability to find her once she got open. “I think Washington State was in their zone and my teammates did a good job of finding me. I did miss a few open shots too. But my teammates found me and we moved the ball well,” she said. Meanwhile, the Cougars got a strong performance off the bench from senior Ivana Kmetovska. She led the team in scoring with 10 points and was the only one to score in double digits. Kmetovska reflected on her time at Washington State and what it meant. 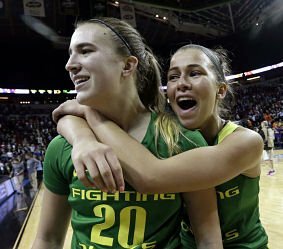 Sabrina Ionescu and Lexi Bando celebrate Oregon’s upset win over Washington Friday in the Pac 12 Tournament. AP Photo by Elaine Thompson. The Oregon Ducks got contributions from several players in helping them upset the third-seeded Washington Huskies, but two players really stood out. Junior guard Lexi Bando led the Ducks in scoring, with 23 points, and kept them alive late in the game as the favored Huskies made a run. 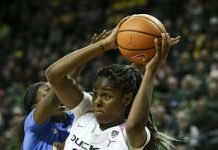 Her clutch shooting, including back-to-back three-pointers, resuscitated Oregon after they fell behind in the fourth quarter. Freshman sensation Sabrina Ionescu was also key for the Ducks, executing various defensive assignments and making big-time plays at key moments. Bando said she knew what she had to do when higher-seeded Washington surged. “I knew I needed to step up and Sabrina was getting me the ball. I just had the mindset that I needed to shot, and the ball ended up going in tonight.” Bando said. Ionescu got off to an incredibly hot start, scoring nine first quarter points, including one ridiculous shot that banked in a three-pointer as the shot clock was about to expire from well beyond the arc. The Huskies made some adjustments and put Kelsey Plum on Ionescu for most of the remainder of the game. Plum did a solid job defensively, limiting Ionescu’s points in the second and third quarters. But when the Ducks needed her the most, Ionescu came through big in the clutch, driving and knocking down mid-range jumpers and then hitting the two most important free throws of her young college career to put Oregon on top for good. Ionescu showed a maturity and confidence well beyond her age. Meanwhile, Washington was primarily led by their two star players in Plum and center Chantel Osahor. 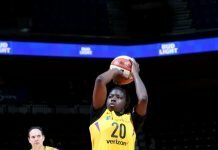 While Osahor didn’t have her best night offensively, she still managed yet another double-double with 12 points and a Tournament-best 27 rebounds. Plum led all players in scoring with 34 points, but it wasn’t her most efficient night. She needed 33 shots to get 34 points and shot just 2-9 from three-point range. While Plum normally gets to the line a lot, was limited to just two free throw attempts in the entire game. She took responsibility for the loss after the game. Plum couldn’t shake the fact that she felt she needed to do more for her team.